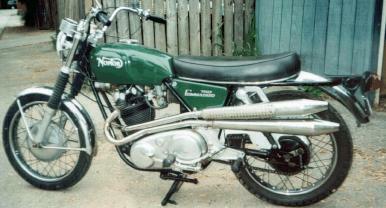 This is a rare model "S" (scrambler) only made for a year with the pipes on one side. All the other Commando models have the regular pipes on both sides. In its day this was one of the fastest bikes on the road. Mine had a custom tank. I'm not sure on the color; I think it was a pearlescant blue; so it didn't have the Norton logo. It also had a custom handlebar, but it wasn't much higher than this, as I recall. I bought it from a guy at work in 1969 and sold it in 1972. 750cc and only weighed 409 pounds, dry. Man, would it scoot!